The Receive tab allows you to scan incoming item barcodes, type or scan a location, and quickly add that item to your inventory. 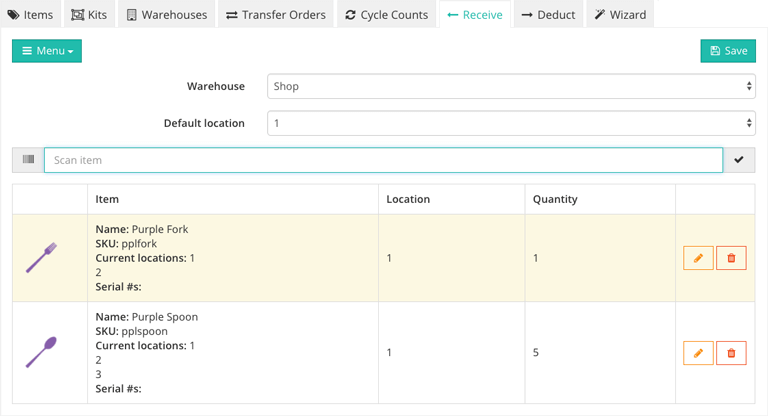 You can use receiving for incoming returns, distributor purchases, and more. 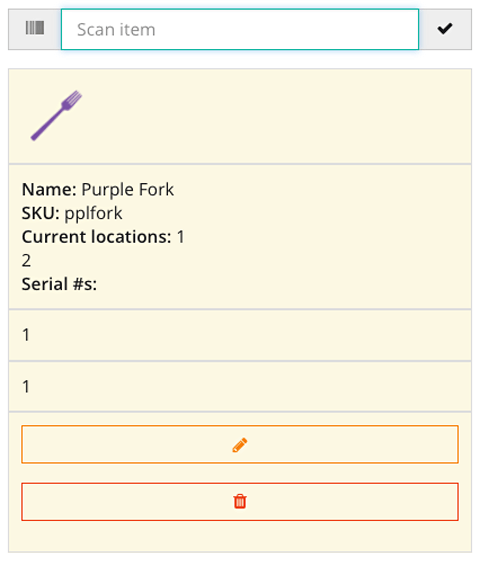 Create item: This allows you to quickly create a new item without having to leave the receiving tab. This is handy if, during a receiving task, you find that you need to receive an item that doesn't exist in your SKULabs catalog yet. Search purchase orders: This allows you to quickly search your open purchase orders by item barcode. If a purchase order appears that matches what you are about to receive, you can click on the PO # to go to that Purchase Order. That way, you can receive what's on that purchase order and close it in one step. History: This allows you to see recently completed receiving tasks, with details such as which items were received, when they were received, and which users received them. Save: When you are finished adding items to a receiving task, you can select this to complete receipt and add those items to your inventory. Name: The name of the item being received. SKU: The unique identifier that is tied to the item and its barcode. Current locations: A list of which warehouse locations the item is currently being kept in. Serial #s: A list of serial numbers that have been added to this item during the receiving process (if any). Location: The location that the item is being received in. Quantity: The quantity being received per item. To receive items into inventory, you'll need to use a barcode scanner to input the barcode of each item you are receiving. To start receiving, select Start scanning to gain access to the scan field. From here, you can begin scanning items with your connected Bluetooth or USB scanner. To receive items, you'll need to scan the item barcode first, followed by the location barcode. If either barcode is not available, you can type in the requested information manually. You can also specify a default warehouse and location to skip the location skip step. If you want to receive a large quantity of items, but don't want to scan each individual unit, you can select the Edit button to quickly change the quantity of an item that you wish to receive. You can also remove an item from the receiving queue entirely with the Delete button. When you are finished adding items to a receiving task, select Save to add those items to your inventory.